A trait I have always thought indispensable to great character writing is specificity. 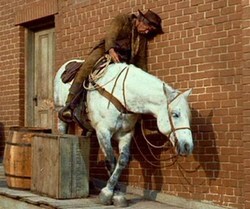 Cat Ballou, however, has little to none and yet yields some of the most loveable and unforgettable characters in cinematic history. It is a love ballad to the formulaic genre of Westerns and all the ways it works on us. But the beloved is not the West; rather it is the archetypes through which we have come to love the West. Director Elliot Silverstein both embraces and mocks Western tropes with fervor; he is as starry-eyed for Westerns as Cat Ballou is for her gunfighter dime novels. The opening sequence—movie credits animated as if they were the contents of a Wild West Show pamphlet—displays from the start the presiding theme of the film: the West as story-come-alive. 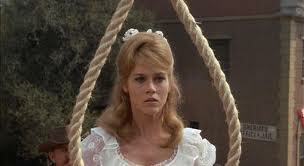 Cat Ballou (Jane Fonda) inhabits a world where everyone has a catch phrase (i.e. Cat’s father’s “shalom alecheim” or Uncle’s “won’t inflict myself on you any further”), where brawls break out at the local square dance, and villains come adorned with Jew’s harp theme songs. 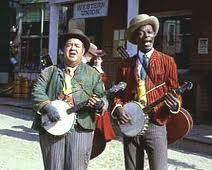 Nat King Cole and Stubby Kaye set the opening scene at the jailhouse, singing the “Ballad of Cat Ballou.” The lyrics present Cat as a famous outlaw, laying out most of her story, starting at the end (imminent death by hanging) and wrapping back to her origins. Throughout the film, the duo acts as a Greek Chorus, reminding the viewer that the events unfolding are the stuff of legend. The balladeers represent the ideal audience, building up the mythos of Cat Ballou. All of this furthers the theme that each element of Cat’s world—the ranch, our anti-hero team of outlaws, the Hole in the Wall where criminals live, even Cat Ballou herself—is part of The Story, written and retold. Characters from her picture books seem to tumble out of the pages and into life. So, when Cat Ballou’s hired gunfighter finally materializes, we are with her in believing he will be the victor, just like in the stories. But, as before, our expectations are broken when Kid Shelleen turns out to be a drunk passed out in the back of a wagon. This, we are learning, is what happens when we try to pull our heroes from their books—perhaps they cannot hold in the real world. As Shelleen says, there’s a “new roller skating rink over the OK Corral.” Now the only place for a gunfighter is in storybooks. For an audience raised on a West that had long been relegated to world of fiction, it is poignant to witness Cat’s realization that the world she knew is already retreating to the storybooks. To drive this point home, our gunfighter fails at his task, unable to protect Cat’s father from the villain with the silver nose (his real nose having been bit off in a fight). When she attempts to avenge his death, Cat is thwarted by an ensemble of paid-off police and townspeople. Everyone in a position of power is against her. Progress seems to have won as the town takes over the old ranch, and Cat has no choice but to run off with her new friends (two handsome thieves, the gunfighter, and the token “injun”). They arrive at Hole in the Wall, a dilapidated town where all the famous outlaws have fallen by the wayside. As all these men have a price on their heads, a deal has been struck between the residents and the sheriff—if the outlaws quit robbing trains and causing mischief, Hole in the Wall will be protected. Cassidy is a raggedy, disheartened bartender in this dying version of the West, while another old cowboy can’t remember his own name. “Ain’t good no more, kid. Nobody cares,” Cassidy says. 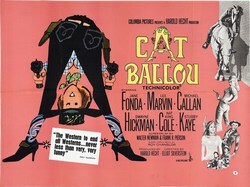 Cat Ballou’s thematic quest, then, is to not allow the West to die. Lending a fairy tale air to the film, in the vein of Peter Pan’s mantra of “never-grow-up,” Cat must interpret the world as Don Quixote does—through books. In order to accomplish this, she decides to rob a train, using a plan directly from a dime novel starring Kid Shelleen. In a rather episodic second act, Kid Shelleen transforms from washed-up drunkard to stylish and distinguished gunfighter, via your obligatory, satirical training montage. He begins to refer to himself and Cat in the third person, repeating “Kid Shelleen and Cat Ballou,” as if he is the MC of his own Wild West Show, or the voice-over for a trailer of a Western. The repetition comes off as frantic, almost pathetic, revealing him as the sad and vulnerable symbol of the old, dead West that he is, despite the frills and tassels. Cat must make it painfully clear she is not in love with him; only then does Kid realize he’s not the hero of this story. Of course, he must pass on one last lesson to the man Cat does love—“It’s a great gift I’m goin’ to give you to know it don’t hurt to fight”—aiding in the transformation of the outlaw Clay, from coward to fighter. Though he acts (at first glance) as the comedic relief throughout the film, Kid Shelleen exposes the darker side of the old West, most prevalently the death wish he harbors and extends through alcoholism. Cat, however, has no wish for death, only a yearning to live hugely. She is the heiress of the Wild West. Raised with the rosy goggles of dime novels, she embraces a fusion of that fairy tale version and its darker underbelly. She will not let the West die, but she won’t allow it remain stagnant either. In Cat’s final act, she shrugs off her prudishness like an old, unflattering coat and embraces her sexuality as another tool in her belt to use against her enemy. She finally kills—the ultimate induction into her life as a true and legendary outlaw—landing her in jail awaiting the noose, back where the story began. Another, darker face to this deed of killing the industrialist, the villain of our film, is revealed when the sheriff says, “You took the bread out of half the mouths in Wolf City.” Cat Ballou’s transformative act had unwittingly put a stop to the town’s payroll and jobs, to prosperity, which the viewer had, up until then, perceived only as a threat to our favorite outlaws’ way of life. A strange and possibly spiked punch of Shane and True Grit, with a dash of slapstick train sequences from Some Like it Hot, Cat Ballou is so much more than a parody. Like the embrace of a beloved and stale-smelling old auntie, Cat Ballou holds us to its bosom and smothers us with Western novelties. This film is as campy as it is smart, as lighthearted as it is heartwarming. Both poking fun and nostalgic, the West and Westerns live on in this modern rendering of the period and our cinematic record of it. 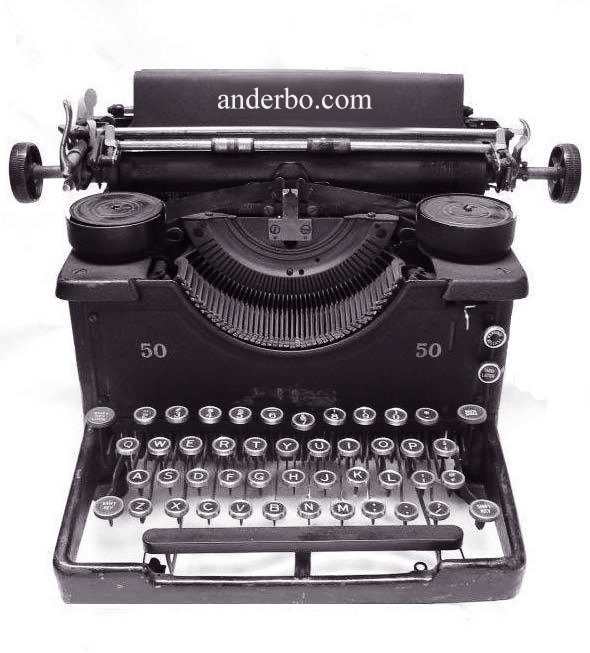 Carmiel Banasky has been published in Glimmer Train, Tottenville Review, and The Boy Bedlam Review. She earned her MFA from Hunter College, where she also taught creative writing. She is the recipient of fellowships from the Santa Fe Art Institute, Vermont Studio Center, and the Virginia Center for the Creative Arts. Currently, she's hard at work on her first novel while attending writing residencies.